Until today, AWS OpsWorks customers have had no choice about whether and when to receive updates for the agent and the built-in cookbook. Beginning today, you can select whether you receive such updates and, if you do, when the updates will occur. On the Add Stack page, in the OpsWorks Agent Version field, choose Manual update and choose an agent version, as shown below. 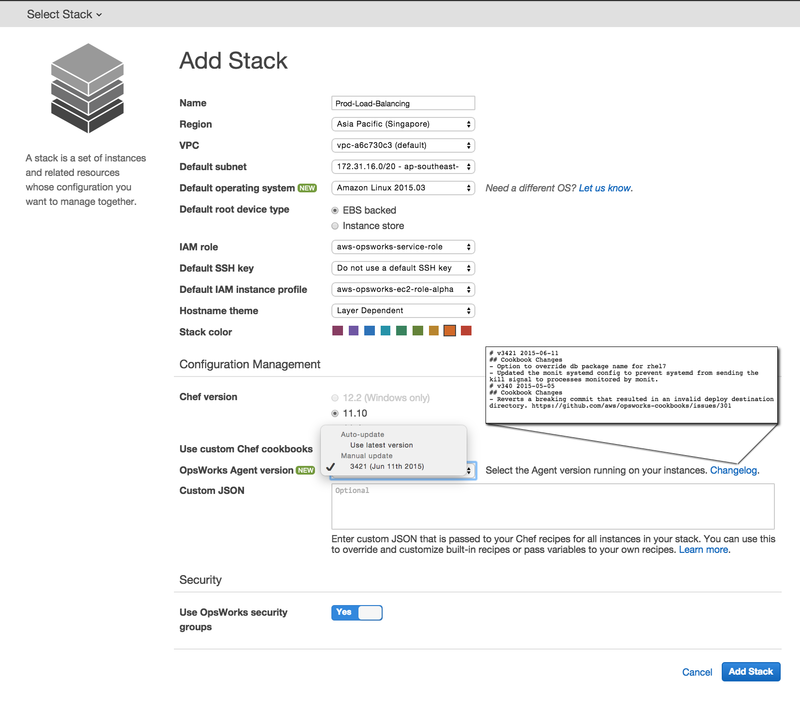 Try this out today by editing one of your stacks to specify an agent version (be sure to do this in your test environment first). This updates the agents and cookbooks on all online instances in that stack immediately. Click the Changelog link to learn about the changes that come with the new agent. You can also update the agent on a single instance instead of the entire stack by selecting a version on the Edit Instance page. AWS OpsWorks continues to run the current version and its associated cookbooks until you change this setting. Read more about the new APIs in the AWS OpsWorks User Guide.